#Pureboardshop just received the brand new fixed gear bicycle collab from #statebicycleandthehundreds. State Bicycle Co and The Hundreds hit a home run with this collab. So Sick. 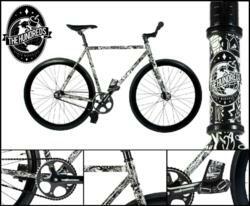 Pure Board Shop has received the brand new fixed gear bike State Bicycle Company and The Hundreds. State Bicycle Co. and The Hundreds have come together for a fixed gear bike. Featuring a black-and-white all-over print frame, custom Holdfast straps and Animal pedals, the two-wheeler reflects a sleek design recalling attributes distinct to each brand. In addition, there is also an exclusive all-black colorway. The bicycle will be available in limited quantities. State Bicycle Co. is a fixed gear/single speed bicycle company based out of Tempe, Arizona. Their goal is to bring the most attractive, high quality, and smooth riding fixed gear/single speed bicycles to the market at the lowest price possible. State currently offers 16 different color combinations, 3 handlebar styles (bullhorns, riser bars, and drop bars), and 5 sizes (49cm, 52cm, 55cm, 59cm, AND 62cm). Each bicycle model that we offer is available for 3 months to a year before it is "retired" and they release newly designed models to replace it -- when they're gone, they're gone. This keeps all State Bikes in high demand and limited in quantities. The Hundreds apparel is inspired by LOS ANGELES LIFESTYLE / CALIFORNIA CULTURE and Southern California’s skateboarding, surf, punk, and hip-hop cultures. The design is reminiscent of 1980s surf-culture t-shirts, independent skateboard company apparel of the 1990s, and the advent of “streetwear” at the end of the millennium. The line is comprised of graphic t-shirts, denim, wovens, fleece, outerwear, headwear, and accessories. In late 2008, The Hundreds also launched a shoe program monikored The Hundreds Footware. And in 2009, The Hundreds’ optical program, The Hundreds Eyeware, debuted to the public. To date, The Hundreds has worked on special collaborative projects with globally-recognized brands and artists like Disney, SE BMX, Garfield, DeLorean Motor Co., Forum Snowboards, Casio G-Shock, eS, Gravis, Medicom, David Choe, Jun Cha, Robbie Conal, Angelyne, H2O, Kurupt, Craola, Avail, and Usugrow. The Hundreds product is sold in limited quantities in the world’s most prestigious streetwear and skate boutiques. Currently, The Hundreds is stocked in over 400 accounts in every major city of the world. More than just an online magazine or clothing line, The Hundreds is a lifestyle project that remains personal and direct, reflective of the community and culture, and dedicated to its fanbase.